Magnetic name badges fastener provides a professional way of displaying name badges and identification without damaging your clothing. Magnetic name badge holder is with strong magnet and metal molded, which allows the tag to be easily clipped onto your shirt or suit without the damaging effects of pins or clips. Magnetic name tags are perfect for suits or expensive clothing which you may like very much and you don’t want to be damaged. 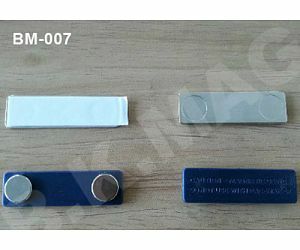 With strong permanent Neodymium magnets attached, the magnetic id badge holder can be used over and over again, therefore it is also called as reusable magnetic name badge. 1.Ideal for professional or hospitality settings . 2.Additional fastener options including strap clips, lanyards, and magnetic are available. 3.Pocket badges do not need a fastener. 4.Available in multiple sizes and shapes. 5.Includes pin or swivel clip fastener. 6.Rectangle metal name badges come with square corners. 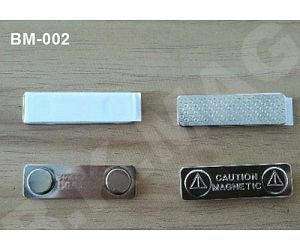 We now have designed five standard designs for magnetic name tag fasteners. 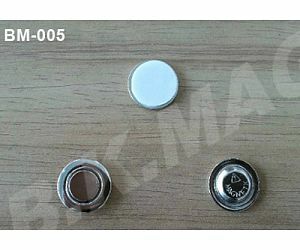 One type is the steel magnetic badge fastener, which consists of 2 pieces NiCuNi plated strong Neodymium Magnets and Nickel plated steel Metal, the size is about 45 x 13 x 6mm. 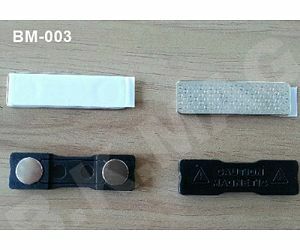 The other type is plastic magnetic badge fastener, which is also called as 3 Comb Green Badge Magnet. 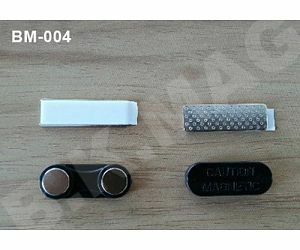 Each set plastic magnetic badge fastener consists of two parts, one part is the magnet bar and the other is the metal bar. 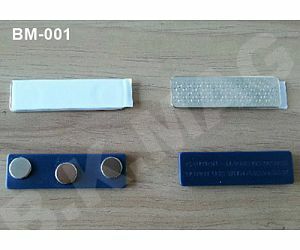 The magnet bar has three pieces strong Neodymium magnets, the metal bar is nickel-plated steel with double-sided foam tape attached. 6, Free replacement for all defects guaranteed. 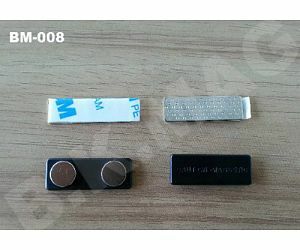 Neodymium magnet (also known as NdFeB, Nd2Fe14B, NIB or Neo magnet), the most widely used type of rare-earth magnet and the world's largest permanent energy product materials. In 1982, Sumitomo Special Metals Sagawa live (Masato Sagawa) found neodymium magnets. It is the most commonly used in electronic products, such as hard drives, mobile phones, headsets, and battery-powered tools. 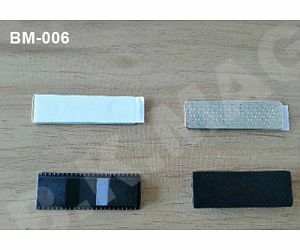 To prevent corrosion damage, the need to make the magnet material surface protection treatment, for example, gold, nickel, zinc, tin plating, and the surface coating such as epoxy resin.